San Diego, California - In a local emergency, the County has turned more than once to the Del Mar Fairgrounds as a regional shelter partner and a large animal shelter and in turn they have provided critical community support. Most recently in the 2017 Lilac Fire, the fairgrounds staff and volunteers cared for and sheltered hundreds of horses. 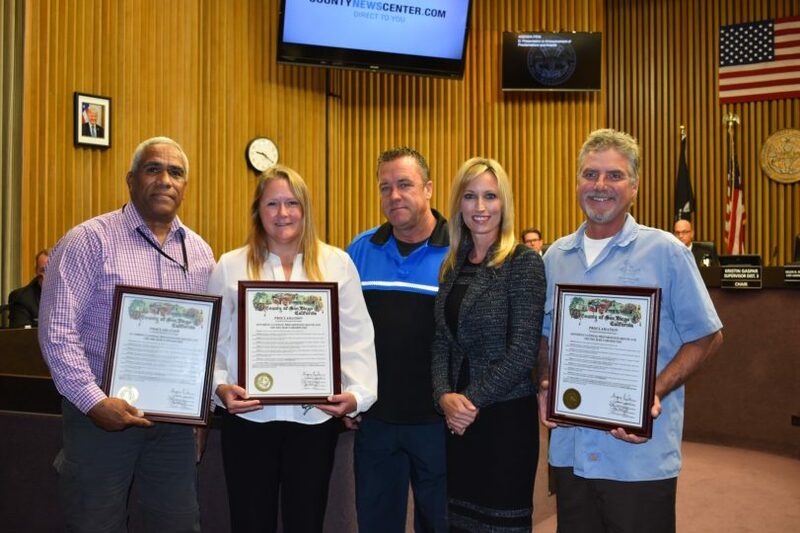 At its Sept. 11 meeting, the County Board of Supervisors recognized the Del Mar Fairgrounds with a special National Preparedness Month proclamation thanking the organization for being part of a network of key community partners. The proclamations lauded the work of fairgrounds staff and volunteers who “tirelessly dedicated countless hours, talent and resources” to the community and helped care for horses and livestock. Additionally, the fairgrounds stores regional sheltering equipment such as cots on its property throughout the year. “We are proud and honored to be of service to our community,” said Amy Billburg, equestrian manager at the Del Mar Fairgrounds. Department of Animal Services Director Dan DeSousa said this vital partnership formed during the 2003 fires and has continued in the years since. “This partnership means there is a safe haven for people and their animals during a disaster,” said DeSousa. Residents can prepare for disasters by having a disaster plan for themselves and pets which includes an evacuation kit for household animals. Develop an evacuation plan with two different evacuation routes. Have a trailer to evacuate your livestock and ensure that the trailer is in good working condition. Make sure that your animals are familiar with being loaded and transported. Locate and prearrange an evacuation site for you and your livestock outside of the immediate area. If you do not have enough trailers to transport your livestock, or may not be at home at the time, have a plan in place with a friend or neighbor who may be able to assist you. Create “defensible space” around your barns and corrals.